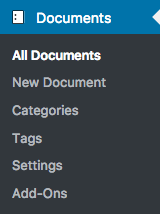 The Documentation plugin for WordPress is intended to provide sound basic structures for a documentation management system. The system provides a completely new Documents section to manage documents independently from normal posts or pages. Documents are classified using their own independent Document Categories and Document Tags.